Escapade is an Unforgettable Music and Dance Experience. "Awesome" and "Unbelievable" are often heard descriptions of the performance. Escapade's rhythm section is a driving wall of high energy accented by horns and percussion. 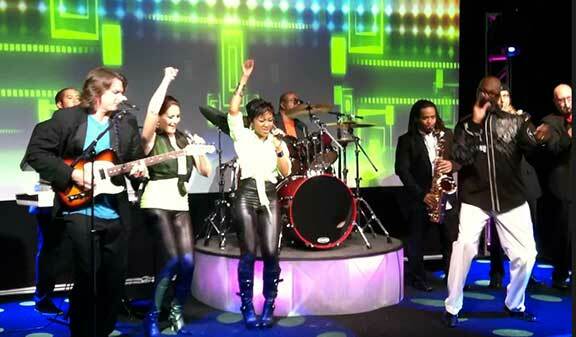 Seven voices, all representing different styles deliver hits ranging from r&b to disco, classic rock to funk. Escapade is as enjoyable to watch as they are to listen to. They know that for the audience to have an entertaining experience, they have to be involved. Not your usual contemporary wedding music. Our approach to your event is comprehensive so that you get a professionally executed and seamlessly delivered entertainment production every time. We begin well in advance of your event by consulting with you to get an impression of your priorities and preferences and to get to know your personality. We continue by contacting all of your other vendors and cooperatively workout a plan for your event that integrates the entertainment with everything else from food service to photography and lighting. And we finally workout all logistics to confirm that the venue is ready for us and the logistics plan for load-in and setup is sound. On sight, the bandleader or music director will oversee the process and ensure a flawless execution of the event. By the time the doors open, nothing has been left to chance and our performers are ready to engage. No other band brings the scope of experience and vision.